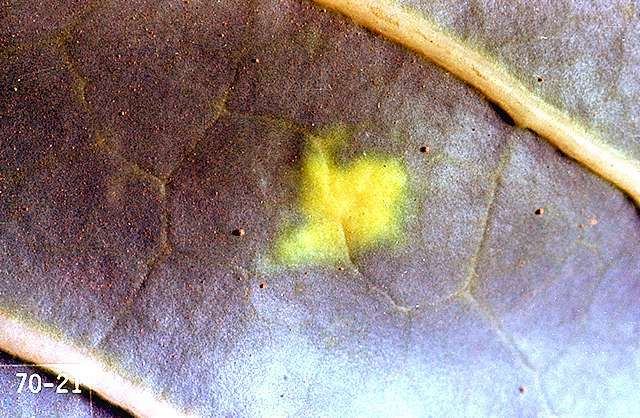 Pest description and crop damage The cabbage aphid is green-gray with a waxy bloom. It forms dense colonies that cannot be removed before processing or marketing. 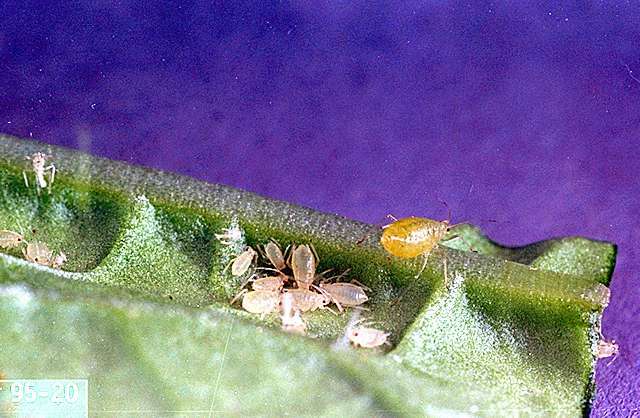 The cabbage aphid is the primary contaminant for harvested broccoli, sprout, cabbage, and cauliflower. The turnip aphid looks very much like the cabbage aphid but lacks the waxy bloom. It tends to be more evenly distributed over plants. 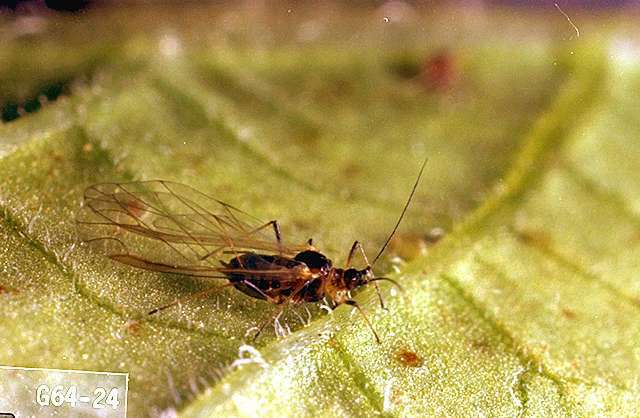 The green peach aphid is slender, dark green to yellow, and lacks a waxy bloom. 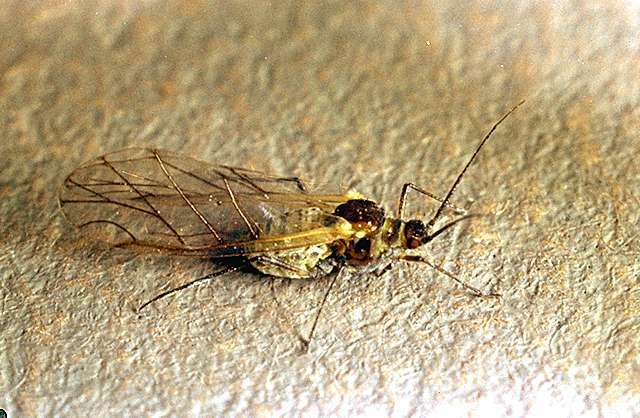 It is primarily an early year pest. Green peach aphid infestations may result in wilting. 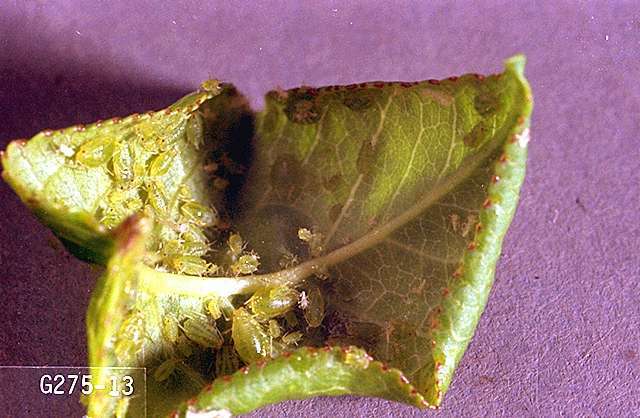 The green peach aphid rarely contaminates harvested broccoli, sprout, cabbage, and cauliflower. Apply when aphid first appear; repeat at 8- to 10-day intervals. plant essential oils and extracts (such as clove, garlic and rosemary oils)-Some formulations are OMRI-listed for organic use. acephate (Acephate 90WDG) at 0.5 to 1.0 lb ai/a. PHI 14 days. REI 24 hr. Do not exceed 2 lb ai/a per season. Retreatment interval 7 days. Do not feed trimmings to livestock or allow animals to graze in treated areas. Brussels sprout and cauliflower only. acetamiprid (Assail 30SG) at 0.038 to 0.075 lb ai/a. PHI 7 days. REI 12 hr. Do not exceed 0.375 lb ai/a per year. Do not exceed five applications per season. Retreatment interval 7 days. bifenthrin (Sniper, Brigade WSB) at 0.033 to 0.1 lb ai/a. PHI 7 days. REI 12 hr. Do not exceed 0.5 lb ai/a per year. Do not exceed five applications after bloom. Retreatment interval 7 days. borate complex (Prev-Am Ultra) as 0.8% solution. REI 12 hr. Spray to complete coverage. Retreatment interval 7 days. OMRI-listed for organic use. chlorantraniliprole/lambda-cyhalothrin (Voliam Xpress) at 0.059 to 0.088 lb ai/a (suppression only). PHI 3 days. REI 24 hr. Retreatment interval 5 days. Do not exceed 0.18 lb ai of lambda-cyhalothrin or 0.2 lb ai of chlorantraniliprole per acre per growing season. chlorantraniliprole/thiamethoxam (Durivo) at 0.195 to 0.257 lb ai/a applied to the soil. PHI 30 days. REI 12 hr. Do not exceed a total of 0.172 lb ai of thiamethoxam products or 0.2 lb ai of chlorantraniliprole per acre per growing season. chlorpyrifos/gamma-cyhalothrin (Cobalt) at 0.26 to 0.38 lb ai/a. PHI 21 days. REI 24 hr. Limit 3 applications of chlorpyrifos products. Retreatment interval 10 days. Do not exceed 2.25 lb ai/a per year. Brussels sprout only. cyfluthrin/imidacloprid (Leverage 2.7) at 0.08 lb ai/a. PHI 7 days. REI 12 hr. Retreatment interval 7 days. Do not exceed 0.17 lb ai/a cyfluthrin or 0.24 lb/a imidacloprid per season. dimethoate (Dimethoate 400) at 0.25 to 0.5 lb ai/a. PHI 7 days broccoli and cauliflower; 10 days Brussels sprout. REI 48 hr; 72 hr where rainfall is below 25 inches per year. Do not exceed 1.5 lb ai/a per season. Retreatment interval 7 days. Not registered for use on cabbage. dinotefuran (Scorpion 35SL) at 0.05 to 0.18 lb ai/a as foliar spray, at 0.23 to 0.27 lb ai/a as soil treatment. PHI 1 day for foliar; 21 days for soil. REI 12 hr. Retreatment interval 7 days. Do not exceed 0.266 lb ai/a foliar or 0.532 lb ai/a soil per season. Suppression only. flonicamid (Beleaf 50SG) at 0.062 to 0.089 lb ai/a. PHI 0 days. REI 12 hr. Do not exceed 0.267 lb ai/a per season. Limit 3 applications per year. Retreatment interval 7 days. flupyradifurone (Sivanto 200SL) at 0.09 to 0.16 lb ai/a. PHI 1 day. REI 12 hr. Retreatment interval 7 days. Do not exceed 0.365 lb ai/a per season. Limit 3 treatments per season. imidacloprid (Admire Pro) at 0.16 to 0.38 lb ai/a soil application or at 0.047 lb ai/a foliar. PHI foliar 7 days; soil 21 days. REI 12 hr. Do not exceed 0.38 lb ai/a soil or 0.23 lb ai/a foliar per year. Retreatment interval 5 days. imidacloprid (Provado, Prey) at 0.05 lb ai/a. PHI 7 days. REI 12 hr. Do not use more than 0.23 lb ai/a per year. Retreatment interval 5 days. malathion (Malathion 8) at 1.25 lb ai/a. PHI 2 days for broccoli, Brussels sprout, cauliflower; 7 days for cabbage. REI 48 hr. Retreatment interval 7 days. Limit 2 treatments per year. naled (Dibrom 8) at 0.94 lb ai/a. PHI 1 day. REI 48. Do not exceed 9.4 lb ai/a per year. Retreatment interval 7 days. Limit 5 applications. oxydemeton methyl (MSR Spray Concentrate) at 0.375 to 0.5 lb ai/a for broccoli, cauliflower and Brussels sprout and at 0.375 to 0.75 lb ai/a for cabbage. PHI 7 days for broccoli, cabbage, and cauliflower; 10 days for Brussels sprout. REI 7 days (see label). Limit 3 applications per year. pymetrozine (Fulfill) at 0.086 lb ai/a. PHI 7 days. REI 12 hr. A penetrative adjuvant may improve control. Retreatment interval 7 days. Do not exceed 0.17 lb ai/a per season. spirotetramat (Movento) at 0.06 to 0.08 lb ai/a. PHI 1 day. REI 24 hr. Reentry interval 7 days. Do not exceed 3 applications per year. thiamethoxam (Actara) at 0.023 to 0.047 lb ai/a. PHI 0 days. REI 12 hr. Retreatment interval 7 days. Do not exceed 0.172 lb ai/a per season. zeta-cypermethrin (Mustang) at 0.04 to 0.05 lb ai/a. PHI 1 day. REI 12 hr. Retreatment interval 7 days. Do not exceed 0.3 lb ai/a per year.